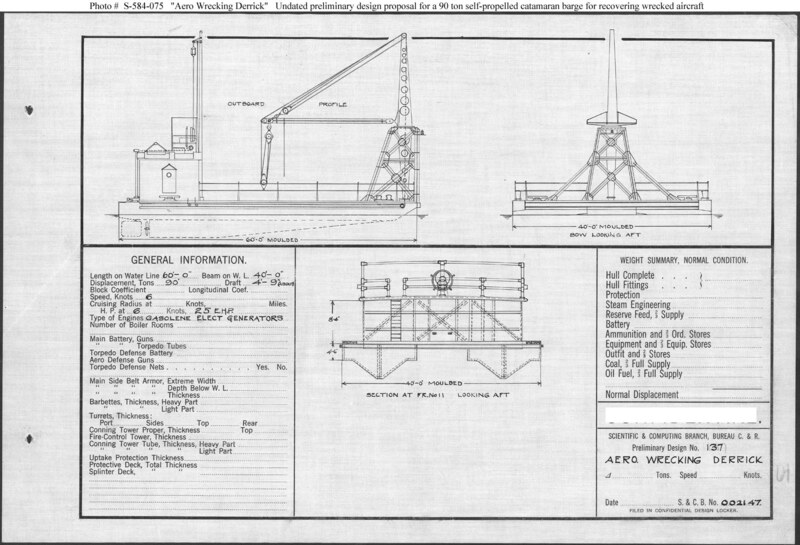 Preliminary design plan for a coastal aircraft recovery craft, built at Charleston Navy Yard in 1916 as Floating Derrick # 28 and soon reclassified as Seaplane Wrecking Derrick # 1, becoming YSD-1 in 1920. The vessel served at Naval Air Station Pensacola until 1923, recovering over 60 seaplanes during its first year of service alone. YSD-1 operated at Norfolk from 1923, save for a brief deployment to Annapolis in 1932. YSD-1 was transferred to the War Department in 1933. This plan provides a single 13,000-pound capacity derrick forward, gasoline- fuel electric motor propulsion driving two propellers, and a speed of 6 knots in a craft 60 feet long on the water line, 40 feet in beam, with a normal displacement of 90 tons. The two “V”-shaped hulls were connected by a thin steel deck covered with 3-inch wood planking.